The dialogue component assigns an Amazon Lex chatbot to an entity. You can use this component to enable a host or other entity to converse with a user and collect information. To use Amazon Lex during playback, the scene needs AWS credentials from Amazon Cognito Identity. Create an identity pool for your scene, and configure it under AWS configuration in the scene settings. Name – The name of the Amazon Lex bot. Alias – The alias that you choose when you publish the bot. To trigger dialogue during playback, use a state machine or script component on the same entity. To use an Amazon Lex bot, add a state machine to an entity with dialogue and speech components. Use actions to capture audio or text, send it to Amazon Lex for processing, play the response, and wait for additional input. Collect text – A Get HTML text action that retrieves the contents of the input element in an HTML component. Entity – An HTML element with an input element. HTML element selector – The ID of the input element. For example, #myTagId. Send to bot – Send text input to dialogue bot sends the text from the previous state to your Amazon Lex bot and relays the response to the next state. Transition On response ready to Play response, and On processing error to Collect text. Play response – Start speech plays the response from Amazon Lex. Transition to Collect text. Use Lex response – Enabled. Record (1) – Key down waits for the user to press a key. Record (2) – Start microphone recording records audio and Key up waits for the user to release the key. Record (3) – Stop microphone recording completes the audio recording and passes it to the next state. 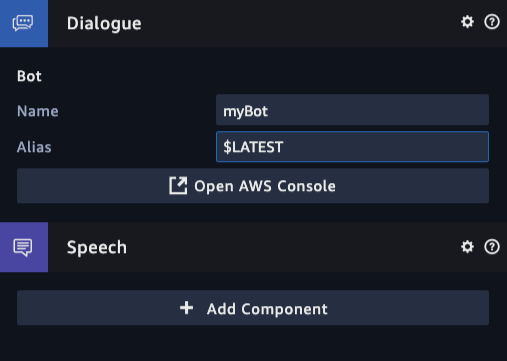 Send to bot – Send audio input to dialogue bot sends the audio from the previous state to an Amazon Lex bot. Play response – Start speech plays the audio response from the previous state. Transition to Wait. For more information, see AWS Feature State Machine Actions in Amazon Sumerian. You can use a script to update the configuration of an entity's dialogue component in response to user input. The following example adds a listener to two buttons to change the active bot when a button is clicked. Entity – Host or other entity with a dialogue component.